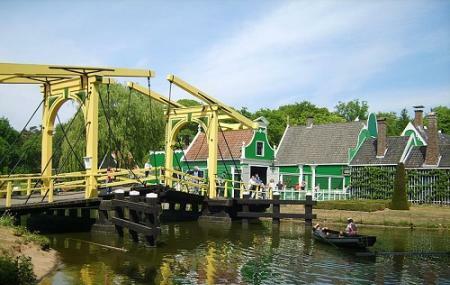 Find hotel near Netherlands Open-air Muse ..
Netherlands Open Air Museum is a national museum located in Arnhem. Arnhem is a town filled with ancient houses, tiny eateries and lush green woods. The museum is near the woods and is spread over 44 hectares including buildings and displays from various time periods. It was established in 1912, and was about to close down in 1987. Due to its popularity, it’s time was extended. The importance of the park has only increased since then. In 2000, a new indoor exhibit was built. The museum has also won the award for “European Museum of the Year” in 2005. Replications of archaic, traditional structures have been built here to make the younger generation aware of the past era. Some of these structures are Paper mill, Tramway, German border with the “Wire of Death”, Farmhouse, Pumpjack and Amsterdam houses with slums in between them. Create a customized plan for your visit using the Arnhem trip planner. You can use ready templates or start from scratch for the same. Hotels like Fletcher Hotel Restaurant De Gelderse Poort, Het Wapen Van Elst, Hotel Arnhem Centraal and Hotel - Grand Cafe Atlanta will solve your problem of where to stay in Arnhem. Draft the best Arnhem vacation packages using ideal templates offered by TripHobo. Also explore how to reach Arnhem on the go! Love this? Explore the entire list of places to visit in Arnhem before you plan your trip. Fancy a good night's sleep after a tiring day? Check out where to stay in Arnhem and book an accommodation of your choice. How popular is Netherlands Open-air Museum And National Heritage Museum? People normally club together Openluchtzwembad Klarenbeek B.v. and Park Sonsbeek while planning their visit to Netherlands Open-air Museum And National Heritage Museum. This is one of my favourite museums of the world and I have seen quite a lot. It takes a whole day to see everything in this gigantic open air museum (but there's a tram). I come here often. Sometimes just for a stroll, to eat fresh bread from the bakery or I take my international friends who are interested in the dutch history. It is a beautiful museum, worth a visit. As well as for adults as children. In fact, it should be in your list of things to do when in the Netherlands. This museum is very interactive and great for kids. There's so much to do for them. Easy access by car or public transport. Wow!!! Beautiful huge village... Walk through the old farmhouses and into the windmills. I spent 3 hours here and could have easily stayed the whole day. You can spend the whole day here, but got the feeling it was very much at the start of the 'season', as not many activities were going on, and some exhibits were being built/refurbished. Would have got a 4 star otherwise. Worthwhile visit though. Very attractive open air museum with old & classic style buildings. Every building has a worker in traditional clothes telling its story; most speak English. Lots of things to do for kids. It is pricey, we paid over 60 euros for 2 adults and a 9 year old incl parking.